Just six weeks from November's elections, the allegation against Trump's Supreme Court nominee is muddling the campaigns. WASHINGTON — With Supreme Court nominee Brett Kavanaugh’s confirmation hanging in the balance, Republican operatives are growing increasingly concerned that the controversy is contributing to a larger atmosphere of dysfunction and chaos in Washington that is motivating voters against them in the midterm elections. 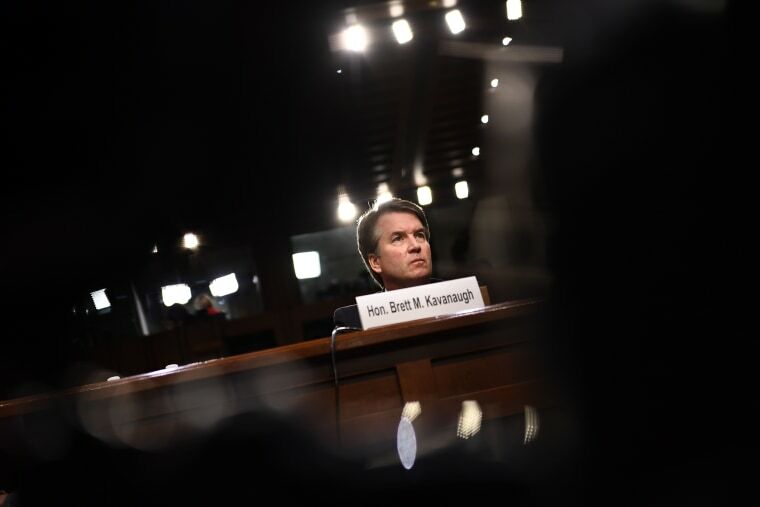 The Senate's confirmation process was thrown off track last week after an allegation surfaced from a woman who said Kavanaugh sexually assaulted her while they were both teenagers, pushing off a planned committee vote that would have moved his nomination forward. Then on Sunday, a new report surfaced in which a woman claimed that Kavanaugh exposed himself to her at a party while the two were students at Yale University in the early 1980s. Kavanaugh has categorically denied both allegations. As the GOP has lost ground among women voters in the #MeToo era, Republican strategists are cognizant of the delicate optics surrounding the public hearing this week between Kavanaugh and Christine Blasey Ford, who says he assaulted her in high school. President Donald Trump’s tweet Friday morning questioning Ford's account is not the message Republicans wanted to project, GOP strategists say. Further complicating the party's message, some Republican candidates are taking a similar tact in an effort to defend the nominee. “This has become a muddled mess for the GOP,” said Michael Steele, former chairman of the Republican National Committee. Republicans have been engaged in discussions all week to strategize how to avoid another Anita Hill scenario, when she was harshly questioned by a panel of powerful men in the Senate Judiciary confirmation hearings for now-Justice Clarence Thomas. Since Ford's allegation surfaced last week, the Democrats have seized on the comments of several Republicans, including Sen. Orrin Hatch of Utah, who told NBC News that Ford was “mixed up” in her recollection. The Senate Judiciary Committee is set to hear from both Kavanaugh and Ford on Thursday, setting up the possibility of a full week's worth of fireworks. But the accusation is already infusing races across the nation. The liberal advocacy group Demand Justice is running television advertisements in key states connecting Trump’s “Access Hollywood” tape comments from the campaign trail, to his support of Moore, who was accused by multiple women of improper sexual misconduct when they were minors, to his nomination of Kavanaugh. Some Republican candidates are expressing support for the nominee and questioning his accuser on the campaign trail. Rep. Kevin Cramer, running for the Senate in North Dakota Senate, said that Ford’s allegation is “even more absurd than” Anita Hill was because, he said, Kavanaugh and Ford were teens at the time and were drinking. His opponent, Democratic Sen. Heidi Heitkamp, called those comments "disturbing" in a statement. A day later, Cramer walked back his statement, telling NBC News that any allegation of sexual assault should be taken "seriously," but he also added that it's hard not to be "skeptical" of Ford's assertion. Guy Cecil, director of Priorities USA, a group that helps to elect Democrats, said that the real test will be how Republicans address the sensitivity of the accuser. “It’s just not about the committee vote or the final vote or whether Kavanaugh is put on the bench, it’s also about the way Republicans have handled this and how they have treated her,” Cecil said. But the controversy is also putting a handful of Senate Democrats running for re-election in Republican-leaning states in a more difficult spot. A vote in favor of a Supreme Court nominee with a blemish free record and moderate stances could have been an easy way to show voters they can be an independent voice and split with their own party. But now, in light of the allegation, it could be more difficult for Sens. Heitkamp, Joe Manchin of West Virginia and Joe Donnelly of Indiana to buck their own party, risking their independent credentials. Polling is starting to show that the news for Kavanaugh is seeping into the electorate. An NBC News poll released on Thursday shows Kavanaugh, who had already been an unpopular Supreme Court nominee, is the first candidate to have fewer people support him than oppose him. Kavanaugh’s loss of support is most prominent among independent voters, where he had a net of 15 percent support in July compared to negative 16 net support now. And much of the loss has come from women, where 27 percent opposed him earlier this summer compared to 42 percent who oppose him in September. But the group that has the strongest support of Kavanaugh is Trump’s base voter. Kavanaugh’s approval improved slightly among this group of men and women. Democratic opposition to Kavanaugh hardened. Strategists say both sides are likely to be motivated by the controversy. “The midterms are considered a base election and both sides are going to be energized by this,” said Ron Bonjean, a GOP strategist at the firm Rokk Solutions. The dynamic is slightly different from House to Senate races as well. Even though the House of Representatives has no role in confirming Supreme Court nominees, all 435 House seats are up, including many vulnerable Republicans in suburban districts where voters have been turned away from the chaos of the president. It does, however, fall nicely into the message Democrats are pushing on the campaign trail: Voters want a check against the president. “Voters in every state say that they have a preference for a divided government or a check and balance, and my hunch is these developments will exacerbate that dynamic,” said a Democratic strategist working on midterm races. And with Ford testifying Thursday, it continues a story that forces Republicans to keep preparing for an unpredictable final next few critical weeks ahead of the midterms.